Co-evolution, which can be defined as interdependence of evolutionary histories, is a fundamental part of evolutionary theories from the times of C. Darwin himself. Inter-species co-evolution and co-adaptation is known to have a large effect on the evolutionary paths and characteristics of the involved organisms. More recently, co-evolutionary concepts have been brought to the molecular level. The evolution of many genes/proteins is not independent but entangled to that of others. The same happens at a lower level for individual residues within proteins. Molecular co-evolution can be due to specific co-adaptation between the two co-evolving elements, where changes in one of them are compensated by changes in the other, or by a less specific external force affecting the evolutionary rates of both elements in a similar magnitude. In both cases, independently of the underlying cause, co-evolutionary signatures between genes/proteins serve as markers of physical interactions and/or functional relationships. For this reason, a plethora of computational methods emerged for studying co-evolution at the protein or residue level so as to predict features such as protein-protein interactions, residue contacts within protein structures and protein functional sites. Co-evolution allows proteins to change while maintaining their interactions and, consequently, it plays a very important role in key biological systems. For this reason, the application of those co-evolution inspired methodologies allowed to gain insight into de functioning of these systems. David Juan, Florencio Pazos and Alfonso Valencia (2013). Emerging methods in protein co-evolution. Nature Reviews Genetics. 14(4):249-261. 1. Korber, B. T., Farber, R. M., Wolpert, D. H. & Lapedes, A. S. Covariation of mutations in the V3 loop of human immunodeficiency virus type 1 envelope protein: an information theoretic analysis. Proc. Natl. Acad. Sci. U.S.A. 90, 7176–7180 (1993). 2. Dunn, S. D., Wahl, L. M. & Gloor, G. B. Mutual information without the influence of phylogeny or entropy dramatically improves residue contact prediction. Bioinformatics 24, 333–340 (2008). 3. Göbel, U., Sander, C., Schneider, R. & Valencia, A. Correlated mutations and residue contacts in proteins. Proteins 18, 309–317 (1994). 4. Fares, M. A. & Travers, S. A. A. A novel method for detecting intramolecular coevolution: adding a further dimension to selective constraints analyses. Genetics 173, 9–23 (2006). 5. Weigt, M., White, R. A., Szurmant, H., Hoch, J. A. & Hwa, T. Identification of direct residue contacts in protein-protein interaction by message passing. Proc. Natl. Acad. Sci. U.S.A. 106, 67–72 (2009). 6. Morcos, F. et al. Direct-coupling analysis of residue coevolution captures native contacts across many protein families. Proc. Natl. Acad. Sci. U.S.A. 108, E1293–301 (2011). 7. Jones, D. T., Buchan, D. W. A., Cozzetto, D. & Pontil, M. PSICOV: precise structural contact prediction using sparse inverse covariance estimation on large multiple sequence alignments. Bioinformatics 28, 184–190 (2012). 8. Mihalek, I., Res, I. & Lichtarge, O. A family of evolution-entropy hybrid methods for ranking protein residues by importance. J. Mol. Biol. 336, 1265–1282 (2004). 9. Kalinina, O. V., Gelfand, M. S. & Russell, R. B. Combining specificity determining and conserved residues improves functional site prediction. BMC Bioinformatics 10, 174 (2009). 10.	del Sol Mesa, A., Pazos, F. & Valencia, A. Automatic Methods for Predicting Functionally Important Residues. J. Mol. Biol. 326, 1289–1302 (2003). 11. Casari, G., Sander, C. & Valencia, A. A method to predict functional residues in proteins. Nat. Struct. Biol. 2, 171–178 (1995). 12. Rausell, A., Juan, D., Pazos, F. & Valencia, A. Protein interactions and ligand binding: from protein subfamilies to functional specificity. Proc. Natl. Acad. Sci. U.S.A. 107, 1995–2000 (2010). 13. Lockless, S. W. & Ranganathan, R. Evolutionarily conserved pathways of energetic connectivity in protein families. Science 286, 295–299 (1999). 14. Reynolds, K. A., McLaughlin, R. N. & Ranganathan, R. Hot spots for allosteric regulation on protein surfaces. Cell 147, 1564–1575 (2011). 15. Pazos, F. & Valencia, A. Similarity of phylogenetic trees as indicator of protein-protein interaction. Protein Eng. 14, 609–614 (2001). 16. Pazos, F. & Valencia, A. 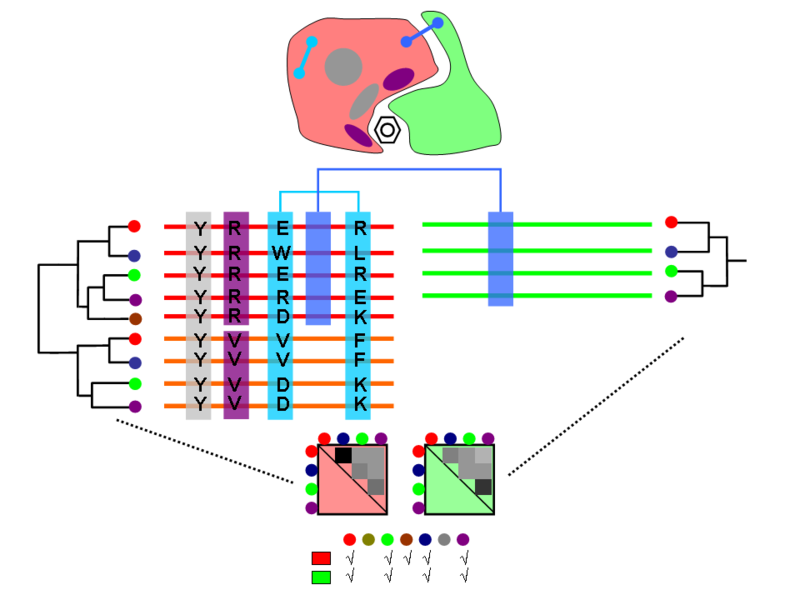 In silico two-hybrid system for the selection of physically interacting protein pairs. Proteins 47, 219–227 (2002). 17. Pazos, F., Ranea, J. A. G., Juan, D. & Sternberg, M. J. E. Assessing protein co-evolution in the context of the tree of life assists in the prediction of the interactome. J. Mol. Biol. 352, 1002–1015 (2005). 18. Juan, D., Pazos, F. & Valencia, A. High-confidence prediction of global interactomes based on genome-wide coevolutionary networks. Proc. Natl. Acad. Sci. U.S.A. 105, 934–939 (2008). 19. Tillier, E. R. M. & Charlebois, R. L. The human protein coevolution network. Genome Res. 19, 1861–1871 (2009). 20. Pellegrini, M., Marcotte, E. M., Thompson, M. J., Eisenberg, D. & Yeates, T. O. Assigning protein functions by comparative genome analysis: protein phylogenetic profiles. Proc. Natl. Acad. Sci. U.S.A. 96, 4285–4288 (1999).